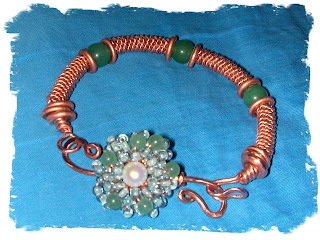 This bangle style is copper coiled tube beads with green aventurine quartz beads and hand hammered copper disks. A lovely freshwater pearl was set and then small Chechz glass druks and more green aventurine beads were added to the handcrafted S clasp. A Spring inspired creation!